Dumfries teams notched up two convincing wins against their Ayr counterparts on Saturday. 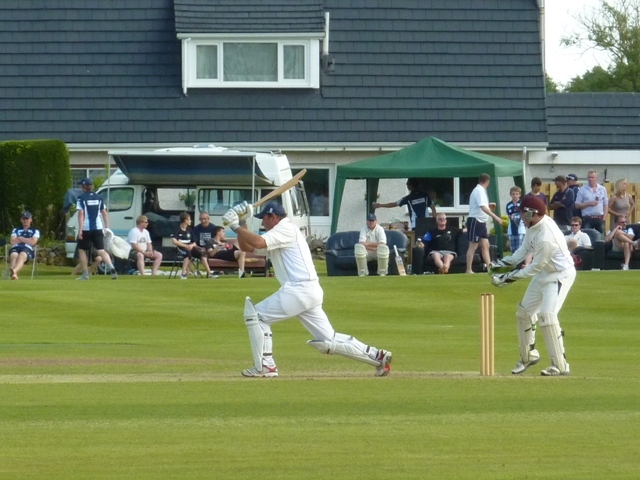 In the Western Premier league APD Dumfries dismissed Ayr for 175 on a sunny Sponsors and Ladies Day at Nunholm. Young pace bowler Niall Alexander claimed four wickets, Alan Davidson three, and the D&G Fire Man of the Match, Peter Lojszczyk took two wickets in a sustained opening spell. Then an unpromising start for Dumfries had both openers gone within four overs, however Todd Griffiths and Chris Bellwood steadied matters with a century stand. Griffiths was out for 41 but Chris Bellwood, with 72 not out, steered the side to a seven wicket win and with fifteen overs to spare. Skipper Scott Beveridge was also there at the end after a hard hitting 33 and Club sponsors, Newbie firm APD, were in attendance to mark their side’s win and also their eighth year of Dumfries sponsorship and support. Eco-Genics Nunholm, the Dumfries Second XI, managed to be back to see that finish, after they had dismissed Cambusdoon for 71 all out in the Western Premier Reserve League. Stuart Alexander took four wickets for the K Carlyle Building Man of the Match and Jerry Goodin took three. The winning runs were hit in only the twelfth over with Chris Brockwell scoring 25 and youngster Dean Brotherston a rapid 21 for another seven wicket win on the day. The Sunday XI, Goodman Dumfries, lost to Poloc at home in the Sunday League with nine balls left. Dumfries hit 198 for 9 and Dave Strachan took the Molplant Construction Man of the Match scoring 53 to add to Chris Brockwell’s 45. However overseas amateur Allcock marshalled the Poloc innings and finished with 92 not out for their four wicket win. Junior Coaching: Monday night junior sessions take place at the Dumfries Sports Club, Nunholm from 6:15-8. For more details about Junior, Senior and Women’s cricket at Nunholm contact Trefor Williams on 01387 256455, or the Club on 07799 856094, email dumfriescricketclub@gmail.com, www.dumfriescricketclub.co.uk, www.twitter.com/dumfriescricket.